Say what?? Ok, when I first saw this at a Sphero demo at ISTE I was blown away. During the entire conference, I went by thousands of booths for the top educational technology companies in the world, and no one had anything close to this feature. At first glance, I was worried this feature was too advanced for my students. However, have no fear! In the Sphero EDU app, Sphero has created animation templates that make this so easy to use. To create an animation, you create multiple different frames of a picture. When it is played together, it creates an animation. This feature really allows your students to be creative and personalize BOLT. One example project is to create animations with arrows to show which direction the robot is going. Another way to use the matrix is the scrolling text command. You simply type a sentence, and it will appear into scrolling text across the matrix. Or you can use the matrix line command to plot coordinates across the matrix. This allows for a great math connection with graphing and vectors. This is probably one of my favorite parts of BOLT. The BOLT has a light sensor on top (it’s the 5 little dots right next to the LED matrix). When you shine a light at BOLT, it can detect the level of light intensity. Sphero has a light sensor program to introduce you to this new sensor, and when the light sensor reaches the maximum level of light intensity, the BOLT will make a surprise! The program is located under the Activities section of the Sphero Edu App. Definitely fun for kids to play around with! While I loved tapping the SPRK+ “to wake it up”, it seems to always fail when I am in front of a class of eager students. Now when you tap Connect Robot on the app, it will automatically start searching for any BOLT that is nearby. I would recommend labeling the robots with an assigned number so you can connect to a specific robot per tablet. I also found this to work with our current SPRK+ robots, so it seems to be an app-wide update for all robots. Win-win for everyone! On a single charge, BOLT can last for 2 or more hours, while the SPRK+ will last little over an hour. That’s double the life! Aiming the robot was always challenging for younger students. Well, BOLT now has an auto aim option! All you do is place the robot in front of you, and BOLT will use a built-in compass to figure out the tablet orientation. However, if you turn the tablet a different direction, you will need to re-aim the robot. I currently only have one BOLT, so I personally have not been able to try this feature. But I’ve seen a demo, and it looks pretty cool! All of the BOLT robots have an infrared sensor that allows the robots to send signals to each other. For example, if you wanted to create a Pac-Man game, you could have one designated BOLT “Pac-Man” and program another BOLT “ghost” to follow it. Or use the matrix animations to create Pac-Man and Ghost images appear! I could definitely see this as a great activity for a STEM Family Night! 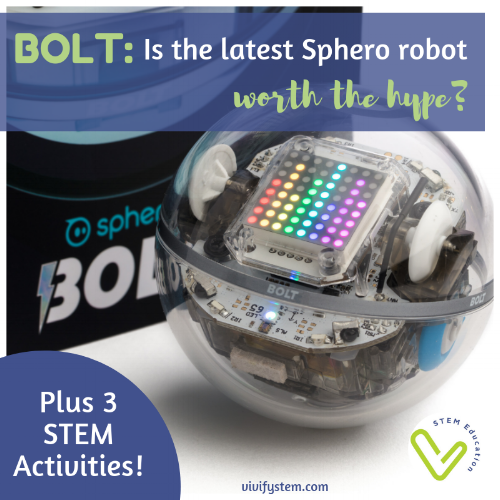 Are you ready to start using Sphero BOLT in your classroom or program? Here are three fun STEM activities created to use the new features of the BOLT. In the classic Sun Angle Activity, students point a flashlight down towards a piece of paper and observe the area on the paper that is illuminated by the flashlight at different angles. Now try this activity with the BOLT robot! Instead of pointing the flashlight on a sheet of paper, use the light sensor on the BOLT. I tweaked Sphero’s light sensor program to provide the percentage of light intensity. For example, when the flashlight is at 0 degrees (mimicking the sun at the horizon), the sensor would read 0%. When the angle of the flashlight is at 90 degrees or directly overhead, the sensor would read 100%, indicating that the solar intensity is at the maximum level. Students can use a protractor and try moving the light to various angles to record different outputs as well as noticing how the shadow of the BOLT changes. The BOLT animation matrix is a great introduction to teaching animation. By using the matrix animation command, students can easily create their own animations and test them in real time! If you’re interested in taking this a step further, Piskel is a free website that lets you create larger animations which you then can save as a GIF! If your kids love video games, check out this video below to spark discussion on the evolution of video game animation. You can even connect pixel animation back to computer programming by teaching your students how to program a Flappy Bird game, which is a popular pixel based game. BOLT’s matrix animation brings abstract math and physics to life. For example, students can use the matrix pixel command to plot points with BOLT. Or connect with 2-dimensional vectors by using the matrix line command to plot vectors on the BOLT. I honestly believe that Sphero is a unique company that values innovation and bringing high-tech resources into the classrooms for students of all ages. I enjoy using Sphero in my own classroom, and I love sharing my lessons. In the Sphero Edu app, you can find my account at ameineke to see my past SPRK+ activities as well as any new ones I make for BOLT. And I hope these ideas help you maximize learning with Sphero robots in your STEM program! Ready to purchase the BOLT? Check it out here on Amazon.